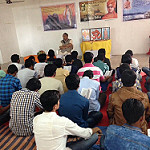 This is a final part of Safal Yuva Samarth Bharat programme. Adjustment with busy schedule , all participants were gathered for nation. With this great motto , the whole camp was organized. Needless to say that , this camp has brought some important virtues itself. All participants were enlightened with the camp’s stuffs. Their day was started with Pratahsmaran and ended with Aatmavlokan. Eknathji’s movie and many more inspirational lectures were made them thinker for Bharatmata’s future. At the last day of the Shibir, Aa. Kishorji and Aa. shitaldidi were being the heart of the Shibir. On the last day also we had a Niyojan bethak – in which we had done planning for Sanskarvarg, Kendravarg and their effective Sampark.